Why should I join CCAC? 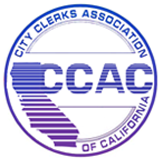 Your membership ensure that the City Clerks Association of California (CCAC) can carry out its mission of promoting the profession of City Clerks through education, support, and communication. Your membership entitles you to reduced registration rates for the City Clerks Annual Conference, League of California Cities’ New Law and Election Seminar, and various other training opportunities. In addition, members are eligible for numerous scholarship opportunities, may serve of on the Board of Directors, and vote in Board elections. CCAC consists of 16 geographical regions. Each region is represented by a Regional Director and members are automatically assigned to the appropriate geographic region upon payment of dues. How can I join CCAC? If you are interested in becoming a member of CCAC, please forward your basic contact information to the Second Vice President at [email protected]. Your profile will be created and a Welcome Letter and dues invoice will be forwarded to your attention. Membership dues are on a sliding scale based on the municipality’s population or whether you are employed by a Governmental Agency, such as a Special District, Joint Powers Authority, Community Services District, or Community College/School District. Membership dues are reviewed annually. ** Includes Special Districts, Joint Powers Authorities, or other Governmental Agency. Important Note: CCAC Memberships are based on a calendar year, January through December. CCAC does not offer pro-rated membership. Example: A City Clerk signs up for new CCAC membership in August. That membership will expire on December 31 with a renewal invoice being sent in January. Any appointed or elected City/District Clerk or appointed Assistant City/District Clerk or Deputy City/District Clerk representing a City/Agency in the State of California is eligible for Primary Membership, on the basis of one Primary Member per City/Agency, upon payment of the annual dues. Each City/Agency shall designate by name and/or position its Primary Member. In the absence of such designation, the City/District Clerk shall be the Primary Member. Any Assistant City/District Clerk or Deputy City/District Clerk whose City/District Clerk is a Primary Member, institutions and/or organization whose operations are closely allied with the functions of the City Clerk's office, and professional persons in fields directly related to municipal government, are eligible for Associate Membership. Lifetime membership can be conferred on any person who requests such membership and fulfills all of the following criteria: employed by one or more municipalities performing City Clerk duties for at least 10 years; has been a Voting and/or Associate Member of the organization for at least 10 years; has been a Voting Member of the association for at least 2 years of total requirement of 10 years membership. Any former Voting or Associate Member who has left office and who is not a Lifetime Member may request an Affiliate Membership with CCAC board approval. Honorary membership may be proposed at any CCAC Annual Conference either by the Executive Board or by a petition signed by 10 or more Voting Members, for any person who is not eligible for Primary, Associate, Lifetime or Affiliate Membership and who has contributed in an important way to the improvement of the City Clerk profession. All Primary and Associate Members shall be voting members. Voting Members, whose cities are a member of the League of California Cities, may hold the offices of President, First Vice President, Second Vice President, Recording Secretary, and Legislative Director.